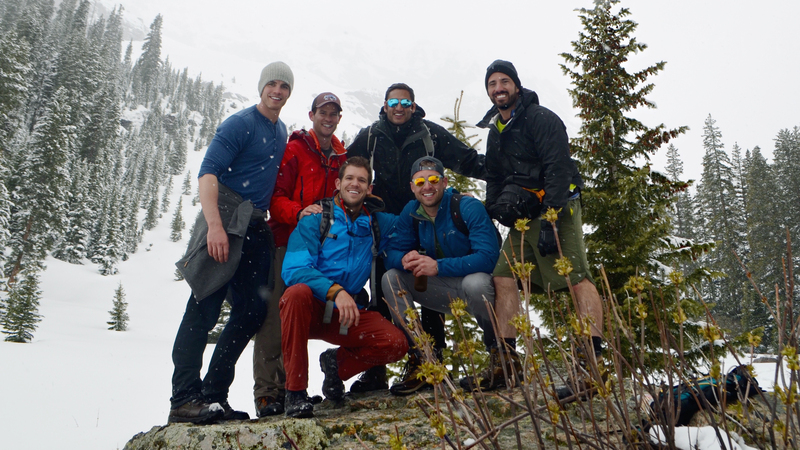 On May 23, 2015, five of my best friends and I planned to summit Mount Sneffels – a demanding 14,000-footer in Ridgway, Colorado. My hiking trip ended at 11,000 feet when I slipped off a rock and fell headfirst into the snow. Upon impact into the snowbank, I couldn’t move my arms or legs and lost all sensation. The trauma broke my neck, and I was immediately paralyzed from the neck down. It’s difficult to articulate the gravity of my 23-hour journey to get down the mountain from the accident site and into surgery. The second I landed, I knew something was wrong. My head was submerged in the snow, my body sticking straight up in the air, like a light post driven into concrete. I couldn’t connect my mind to my body to move. I envisioned maneuvering out, but convincing my body to act was impossible. When I opened my mouth to scream for help, I swallowed snow. I was suffocating. Moments later, my friend Michael hoisted me out of the snow by my ankles. In agony, I told my friends I’d lost all movement below the neck. They were awestruck, but went into fight-or-flight mode to strategize how best to save me. Drew and Ben took off down the mountain to seek cell service and help. Michael, Sean, and Spencer stayed with me. Soon night fell, the temperature dropped below 30°, and a 12-inch snowstorm hit. For six hours my friends immobilized my neck, supported my spine, and tried to calm me. Thankfully, one had brought survival gear, including an inflatable air mattress and heated space blankets. Without question, my friends undressed and layered me in their jackets and socks. They took turns curling beside me to share body heat. They kept up my spirits with talk. Not once did they complain about the cold. But as snow accumulated on my limp body, I panicked. I felt claustrophobic in my own body. Snow fell on my face, and I couldn’t wipe it off. My torso felt weightless, as if detached from my body. I alternated between composure and screaming obscenities. I shut my eyes to protect my mind, momentarily, from the terrifying sight of my paralyzed body in a snowstorm. I started to accept the reality of death. But this moment was short-lived. I kept reminding myself: I was only 25. There’s so much in life to learn, to love, to experience, to accomplish, and to see. My life couldn’t end with a paralyzing fall into three feet of f***ing snow. Even after a ten-person mountain rescue team arrived, six hours in, the news was bleak. They tried to get a helicopter to airlift me out, but weather didn’t allow it. So they encased me in a coffin-like insulated body bag with a hole for my eyes and nose. They carried me six more hours down the unforgiving mountain trail through the snowstorm. We arrived at the hospital, and into surgery, 23 hours after the fall. I was diagnosed with an incomplete quadriplegic spinal cord injury – burst C6 fracture, C5 and C7 vertebrae compressed. My doctors said I’d be lucky to walk in a year or two. But with support from my family, friends, colleagues at Uber, and medical teams, I passionately committed to 20-30 hours of rehab a week for 18+ months. Today, I’m preparing to complete a paratriathlon sprint (swim, bike, run) in 2018 and, in 2018-2019, to summit Mount Sneffels and to stand on the rock I was paralyzed on. Let me try to dispel that myth for you. I want to tell you how I crystallized positive reframing strategies that carried me from rock to rehab to my recovery. These insights will guide you chronologically through this journey. These nine reframing lessons, which combine acceptance, present-day awareness, and resilience, are also learnable skills. They helped me find excitement in mundane and dire situations while tricking my mind so I could endure. They’re translatable to your battles. The six-hour stop-and-go hike through a snowstorm with the rescuers proved to be more of a psychological roller coaster than the six hours spent waiting for them. As they carried me down the mountain, I lay motionless in the body bag, alone with the rabbit holes my mind created. Dwelling on “Why me? What could I have done differently?” was useless. Still, I wondered, as an adventurous, former athlete and a young professional, “what in life was worth living for if I was paralyzed? As well as I could in the body bag, I tried to force my mind to visualize the people, places, and experiences that I wanted to see or relive again. As if I was daydreaming to escape that current nightmare. For example, I vividly pictured myself in an open field, playing baseball with my little sister Laila. Now, I tell everyone who I visualized, that they motivated me before they even knew I’d been injured. After surgery, my doctor confirmed my broken neck and grim prognosis. But to be honest, I was excited. I was excited to begin rehab to relive the experiences in my daydreams. Confined to an ICU bed, I couldn’t control my body. I could barely move my toes or lift my arms to hug my mom. But I could control the passion, discipline, and focus I’d devote to reclaiming my livelihood. I was determined to seize control back from the accident and channel it into recovery. At the Rehabilitation Institute of Chicago, I miraculously took my first steps, moving from a wheelchair to a walker just 19 days after surgery. Sure, it was only 60-feet in six-minutes, with eight rest breaks in my wheelchair… but they were steps. Progress. A few months in, my next exciting therapy milestone: getting ready in the morning on my own. There were so many steps: using my core muscles to sit up in bed, taking off my gown, getting out of bed, grabbing my clothes, changing into them, putting on socks and shoes, grooming myself. Things many of us do mindlessly, half-asleep each morning. That first time, it took me two hours. As frustrating as that was, it hit me right then: if you’re the type of person, like me, who believes you’re not a quitter, that you’ll finish what you started . . . well, I hate to say it, but at the start, paralysis—like many grim prognoses—gives you little choice. I did just want to quit at that moment. But despite my condition, I was a human being with a choice to make: to find ways to accept my circumstances and continue to endure. I quickly realized that early on, the strongest muscle I had to exercise was my mind. Just a hope, a prayer, a dream, an f-bomb… and a mindset. I knew I had to take agency and prove to my mind and my body that I was in charge of my life. With acceptance, I realized you can’t change what is, until you accept that what is, is. I couldn’t change the trajectory of my recovery until I accepted the current state of my recovery. When I thought to move my hands and legs, like I always have, my body was silent. My body refused to connect and comply with my mind. Tying a shoe was as mentally complex as completing a crossword. Stepping off a curb took as much mental energy as sprinting across a highway. When you can’t connect to your limbs, feelings—fear, discouragement, frustration—intensify. I came to recognize that you can have the best toolbox in the world, but you can’t fix a car without knowing how the parts work. I asked doctors, therapists, and friends in medical school to teach me how to reconnect my body’s nerve pathways. With no medical background, I grasped what I could. One thing was clear: repetition is key. In addition to exercises with my rehab teams, repeated mental practice on my own would pay dividends. When I repeatedly visualize an action, like spreading open my hand, even if it remains balled in a fist and my fingers barely move . . . it’s progress. It’s a mental rep. I’m patiently retraining my nerves to regenerate and fire along different pathways. By repeatedly imagining my motionless body moving, I learned that I could potentially enhance the reconnection of the brain to the spinal cord (study 1, study 2, study 3). When retraining my mind and body to connect after my injury, I needed to reframe failure. As badly as I wanted to wake up and hop out of bed to live independently . . . this process would take time (days, weeks, months, years), patience, and acceptance of failure as progression. Getting pushed safely by physical therapists to the brink of failure or falling is actually a step in the right direction. Visualizing or performing actions without results can be demoralizing. But as long as I relentlessly paired visualization with the intent to move, my body progressed internally. To trick my mind to overlook failure. I accepted that failure to move my body was still progress. This injury has taught me that we control little of anything or anyone. And that’s okay. Because the one thing we can control, spinal cord injury or not, is our present-day mindset. I can’t control what happened two minutes ago, two months ago, or two years ago on that rock. The same goes for two days from now, two months from now, or if I stand on that rock again. What I can control is staying passionate but also content with the things I can presently control in, and out of, rehab. Studies show that, ~47% of the time, our minds wander to things other than what we’re presently doing. With this injury, my mind wandered—a lot. It was tempting to get lost and imagine alternative “woulda/coulda/shoulda” scenarios outside my control. But I noticed this had a uniquely counterintuitive effect. Given the mental complexity of performing even simple tasks, the more my mind drifted, the less effectively I relearned each task. To limit this, I put a greater value on mindfulness. The spinal cord injury forced me to slow down and be present. It’s our choice to wake up and mindfully persevere. Rehab isn’t glamorous. I spent months learning to balance on one foot and years picking up and turning over tens of thousands of building blocks to rebuild my fine motor control. The tasks are mind-numbing. Mustering the energy to power through is hard. But this makes faith in the rehab process even more compelling. To survive an unpredictable prognosis, I needed to let go of the outcomes and fall in love with the day-to-day process—including the battle scars, the setbacks and the non-believers—to complete my recovery. This mental technique helped me find excitement in tedious but critical situations. I’m not perfect at this. Not at all. But forcing myself to bring awareness to this mindset has been instrumental in my progress. When I’m mindful, I can gauge progress and pinpoint development internally. Things I did just a little better than the time before. This is key – because we all have days that seem stagnant on paper. I had days when I couldn’t walk faster, harder, or longer. But if I lost my balance only twice instead of five times on the treadmill, I’d reframe that as a milestone worth celebrating. While struggling to stay upright on a treadmill, I was able to endure the experience with gamification. I found a way to turn these seemingly defeating results into rewarding moments. This mindfulness technique helps me spot often overlooked daily victories – incremental advances that excite me and boost my confidence. It confirms that the process in place is delivering results. To identify small victories, I seek opportunities to do things for the “first-first” time again. We may not remember when we first stood up, walked, fed ourselves with a fork, or hit a basketball shot. But thanks (“thanks”) to this injury, I have a unique opportunity to relearn, experience, and celebrate these moments again. ● July 2015: The first-first time I could open a protein bar wrapper. That day it took me 20 minutes to open it, after months of unsuccessful attempts. ● September 2015: Cooking a meal the first-first time, for my family. I burnt the s*** out of that omelet but I’ll always savor it. ● November 2015: Six months after the accident, my friends and I completed the RIC Skyrise fundraiser. Using a cane, I trained for months to walk 103 floors up the Willis Tower. My friends and I saw this as practice for our ultimate goal: to reclimb Mount Sneffels. ● March 2016: I jumped up onto a 25-inch box (a “box jump”), seven months after jumping half-an-inch for the first-first time. ● May 2016: I jogged on flat land without a harness the first-first time. ● September 2016: Just as I’d daydreamed on the mountain, I played baseball with my sister Laila the first-first time. ● July 2017: I ran my first-first 5k to prepare, someday very soon, for a paratriathlon. This “first-first” mindset is, for me, an exciting reframing technique to look forward to post-injury accomplishments that were once automatic. The more often I catch small victories, the more confidence I gain to do things without overthinking them. Then they become second nature. As a society, we seek out big, shareable milestones and instant gratification. But if I only found happiness by climbing that mountain, something that could take years to accomplish, the process leading up to that summit would be a nightmare. By reframing the definition of a win and outlining first-first milestones you can find continued day-to-day happiness, without losing sight of your ultimate goal. An unexpected win as a result of my spinal cord injury: watching my seven-year-old sister Laila grow ever resilient. This experience has made her stronger, wonderfully independent, and more empathetic. I tried to answer honestly, because I knew she was saying in a roundabout way, “I’m scared, are you, too?” I replied, “Yes, I’m scared. But I trusted the preparation I’ve done with my rehab teams.” It’s one thing to tell your kid sister the typical lesson, “It’s okay to fall, just get back up again!” It’s quite another to eat s*** ten times on a bunny slope right beside her. Together we fell and fell again – but then we got up and conquered a goal together. Going into that weekend, Laila felt comfortable only on a bunny slope. As I progressed, though, her own confidence grew. That weekend, she skied her first intermediate slope, solo. Resilience is a muscle we can build. And not just when bad s*** hits the fan. We all have it. We’re all more resilient than we imagine. We all push to survive. It’s the ability to trick our minds to go a little further each day. It’s the muscle you flex, when the going gets tougher. It’s an antidote that helps you refocus on the day-to-day steps that ultimately feed into your values and goals. The day you redefine your discomfort as a privilege, your life will change. Since I began outpatient therapy in 2015, my all-star rehab teams and I have done everything to reclaim my livelihood and fulfill my dream to conquer Mount Sneffels. In addition to traditional physical and occupational therapy, I embraced alternative therapies to re-pattern my body and correctly rebuild my mind-body connection. I’ve incorporated yoga, Gyrotonic, Pilates, acupuncture, tai chi, learning to swim, Rolfing/myofascial release, electrical muscle stimulation, and other untraditional rehab modalities into my recovery. Alternative therapies, particularly yoga, Gyrotonics, and Pilates, brought heightened body awareness and promoted natural fluidity in my movements. While relearning how to function, these disciplines allowed me to slow down, engage, and activate the correct muscles without wasted motion. The journey is at least half mental and emotional. And embracing these practices strengthened my mind-body connection in unimaginable ways. With more eyes and ears on my injury—with varied backgrounds and approaches—I’m confident alternative therapies accelerated my recovery. Your journey may not call for alternative medicine—but you should be aware of what constitutes as alternative solutions to unpredictability. Mindset is one thing, but I thank my inner circle—from family to friends to Uber to the Shirley Ryan AbilityLab and my rehab teachers—for hammering home positivity and helping to make every first-first possible. My mom, dad, and family devoted their lives to my recovery. So, it was extra special for my parents and me to relive first-first moments they once witnessed—like standing up, walking, and hitting a baseball. This wasn’t the script for my mid-twenties. But now I appreciate even more how family comes together in a crisis. I’m in a better position to reciprocate the same level of love and care for my family in time. Additionally, as I prepared for a return to Uber following my two-year recovery, I was motivated to find ways to create social good in the communities we serve. With this in mind, I was inspired by an opportunity to join Uber’s mission-driven Trust & Safety team as of September 2017. Collective support from the top down at Uber helped me reintegrate back to work and spurred my transformation massively. Support came from HR to executives, to emails, letters, and charitable donations from offices, teams, and colleagues in Chicago, California, New York, India, China, and elsewhere. Sadly, such employer support is rare within the disability community. Without moral and financial support from employers, it’s incredibly difficult for individuals with recent disabilities to prioritize their health, to feel empowered to focus on their recovery, and to find the motivation and resources to passionately commit to rehab. With a deeper appreciation for the impact support can have, I was also motivated to return to work to help lead our UberABLE employee resource group. With UberABLE, we aspire to create inclusive solutions and support strong employees who embrace physical, mental, and emotional disabilities. I’m dedicated to helping others endure. 1. What “failures” or missed goals in your life can you positively reframe as progress? 2. What processes do you need to commit to, trust, and fall in love with… to give yourself the best opportunity to become the best version of yourself? 3. Stay mindful, and work to identify and celebrate small daily victories. 4. When you inevitably hit a setback, remember resilience is also a muscle you’ve built. Continue to stay focused on the things that matter—the day-to-day steps that feed into your values and goals. 5. Express gratitude to the people around you who help build you up and better yourself on your road to conquering your own Mt. Sneffels. This recovery has no finish line. And happiness isn’t just an outcome. Happiness isn’t even summiting Mt. Sneffels. Rather, happiness is the journey – between the mundane, the battle scars, and the small victories – leading up to the climb. Throughout this transformative journey, it’s been my constant mission to find ways to share my story and insights—through published writing, keynote speeches to help raise funds for my rehab centers, and mentorship and volunteering efforts within the disability community—to spread positive awareness and impact the lives of others. If you’re interested, I partnered with my Chicago hospital to share my experience in this testimonial video. I also continue to plan to write and video document my recovery, from my healing strategies to the ups and downs ahead of my climb. A storyteller and eternal optimist with 6+ years of experience crafting integrated brand marketing strategies to launch revolutionary technology with Samsung and Uber. I joined Uber Chicago in 2014-2015 and helped build and scale our early rider growth strategy to expand across six cities in Michigan and Iowa. But in May 2015, I experienced a spinal cord injury from a hiking accident in Colorado. Thankfully with the support of my family, friends, and Uber, I passionately committed to 20-30 hours of rehab-a-week for 18+ months. I'm grateful that I'm able to prepare to conquer my ultimate goals: to complete a paratriathlon and summit the mountain I was injured on by 2018-2019. I'm grateful my recovery exceeded the expectations of a grim prognosis. Throughout my journey, it's been a constant mission of mine to share my story and learnings––through published writing, keynote speeches to raise over $600k in donations, and volunteer mentorship within the disability community––to spread positive awareness and impact the lives of others. While recovering from a spinal cord injury, I felt more limited in my mobility than ever before. I also learned deeply about the challenges of inclusion. In 2017, I was motivated to return to Uber to make a difference on our Global Safety team. I'm also humbled to lead our mission-driven UberABLE employee resource group – which aims to support strong employees with physical, mental, and emotional disabilities. I'm committed to helping enable others to move safely and live independently.